A permanent, structural or top fixed rigid aluminium safety and access horizontal rail system conforming to EN 795 type D, 2012, TS 16415 and BS 8610. Extruded aluminium rail system which can be fitted to built up, composite metal pitched roofs and a variety of standing seam roof systems, providing an aesthetically pleasing and practical safety system. A direct rivet or seam-clamp to roof rail system that can facilitate changes in direction and roof slopes, ensuring continuous safe roof access. Discrete, low profile design provides a visually unobtrusive safety anchorage solution, with no highly visible anchor points and cables. Provides a safety anchorage system for multiple users, allowing more complex maintenance tasks to be undertaken in an efficient manner, including suspended rope access work. Even load distribution through the fixing system ensures complete safety in the event of a single user fall, without damaging the integrity of the roof system. The solid anchorage ensures no deflection or unnecessary loading of anchor points during use, and makes the system beneficial on roofs with a pitch of more than 15°. A four wheel attachment carriage runs along the extruded aluminium rail, making the system user friendly. The lightweight modular rail system comes in 3 m (9.84 ft) sections, making it easy to transport and handle on site. Eliminates many common hazards associated with cable based fall protection systems including cable fretting, cable tension, cable deflections, accidental roof anchor deployment, passing of intermediate cable supports, roof sheet abrasion and roof traversing. Extruded aluminium rail system combining a simple, continuous and functional anchorage system with high levels of user safety and aesthetics. Cost effective compared to using building maintenance machines. 6000 series aluminium alloy components ensure a quality safety system that will withstand harsh environments and deliver high levels of safety. Discrete design and range of fixing brackets ensure design flexibility and offer concealed fixing solutions to complement building aesthetics. The main rail floats in its fixings to mitigate the effects of thermal expansion and contraction which would otherwise cause the rail to buckle. The system offers workers continuous hands free movement by navigating corners and building contours, thereby providing maximum design and integration flexibility. Tested in accordance with EN 795 type D 2012 and TS 16415 2013, and compliant with OSHA and AS/ NZS standards. For installation by 3M™ DBI-SALA® approved installer. 3M™ DBI-SALA® RoofSafe™ Rail Safety System: Can be used to facilitate roof inspections, routine maintenance, gutter cleaning, facade access, access to roof plants and other roof top work procedures. The system also allows for work positioning tasks to be conducted (such as window cleaning). 3M™ DBI-SALA® Roofsafe UniRail™ Safety System: In addition to fall protection applications, this system can also be used as the primary anchor point for suspended rope access tasks. Can also be specified and designed to facilitate abseil/ roped access work. Consult manufacturer for further information. Can be fixed to others - consult manufacturer. The product information below is from the NBS Plus library of product clauses offered in NBS specification products. 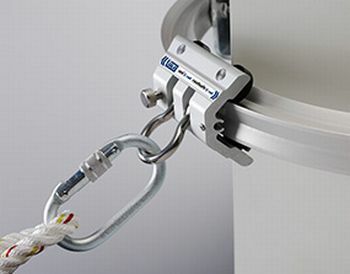 It has been created by NBS for 3M DBI-SALA Fall Protection . Each product clause is authored in NBS format and is intended for inclusion in project specifications. Please note that NBS product guidance is not a replacement for the manufacturer's literature and it is recommended that 3M DBI-SALA Fall Protection be consulted before specifying. Designed for top fixing to modern standing seam/ secret fix and trapezoidal profiles. Designed for fixing to concrete, masonry and steel structures.